With me is Banes and Pitface. Together we talk about fonts and lettering in webcomics. 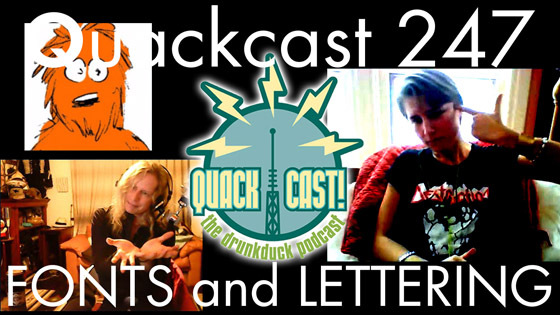 This week's Quackcast marks the end of the Halloweencasts! Late, I know, but we recorded these all in advance. We dressed in costume again, which you can see in our VIDEO. Banes as the arctic death wolf, Pitface as the evil Nancy Regan, Tantz as a fierce Greek pirate rebel, revolutionary warrior, and myself as a horrible, horrible glam metal rocker. The topic of discussion was inspired by another newspost by Banes, this time the subject was “your horror playlist”, so we chat about all the scary, horror themed stuff we enjoy around this time of year. 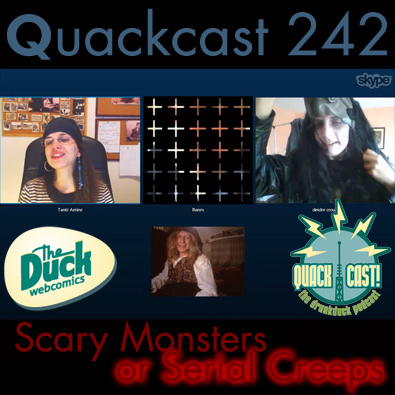 Yet ANOTHER Halloweenie cast! 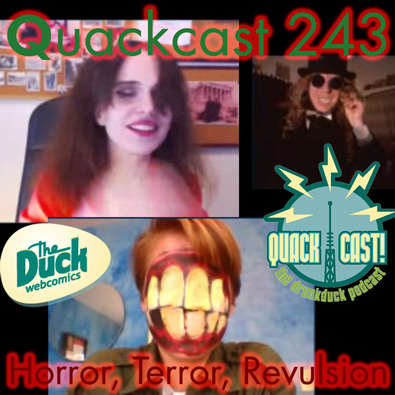 This time we used Banes' newspost for inspiration and we talk about the difference between horror, terror, and revulsion in horror themed media along with examples of that in our own comics. We dressed in costume AGAIN, this time Tantz is Zoe from her comic Wolf, I'm Jack the Ripper, Pit is a mouth-head mutant and Banes is the invisible man! 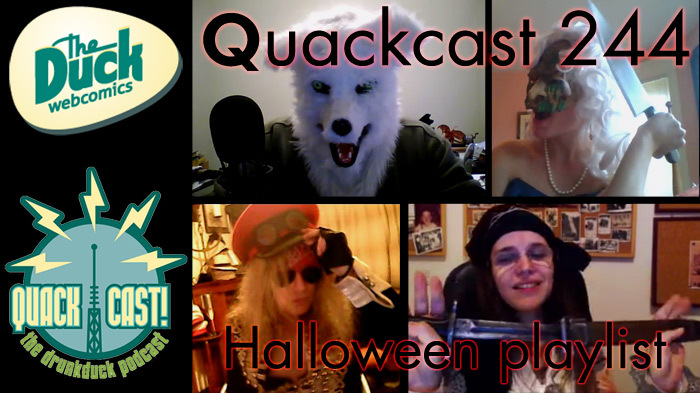 Continuing with our Halloween themed Quackcasts for the month of October, for Quackcast we decided to try and record a full length video of the event, with most of us dressed in hastily assembled costumes. The subject was about the different kinds of antagonist in horror films and which ones people like the best. We had many contributions from people!